When you live in a city, like I do, here in the big smoke of London, every inch of greenery becomes important. When I travelled down to Glyndebourne the other day, surrounded by all of those lush green hills, and the conspicuous silence interrupted only by the occasional sheep cry, it made me realise just how lucky rural dwellers are to be surrounded by that constant beauty and tranquility. Yet it is only human nature not to appreciate what we have when we’ve got it. For all I know, the residents of those sussex country manners probably envy we Londoners who have the whole cultural world right on our doorstep. I do like to count my blessings however, and I actually think writing a blog, which encourages one to reflect more on one’s life, making the most of occasions, events and opportunities for the sake of sharing and recollecting interesting and unique snapshots of life, makes us bloggers appreciate life with a renewed vitality and a very sharp focus. And one thing that I have always appreciated, albeit perhaps more so as my time living in London grows longer and my hours of work increase, is the green space around me. I may only have a balcony to exhaust my green fingers, but that balcony, which runs along the front of my entire flat, is my pride and joy. There is much to be said for the urban balcony. Not only does it help to make urban life more bearable, more colourful, and more sensorily enriched, but also helps to give nature a bit of a kickstart – there have, for example, been reports of huge rises in the numbers of urban dwellers keeping beehives, so many in fact that there are now a surplus of bees for the numbers of suitably pollinating flowers available across the city. I don’t have bees, but what I have created on my balcony is my own piece of tropical paradise. I’ve surrounded my small table and chairs and my all important sun lounger with my own little slice of Spain. There I have a large brugmansia (whose flowers are spectacular bell-shaped blooms which smell glorious at night – they’re not out yet but rest assured, I will share on The Daily Norm once they are), a passion flower, an olive tree, grasses and plenty of geraniums. I’ve also encouraged honeysuckle to grow up the wall, and this year, for the first time, introduced some strawberries into the mix. Because my urban balcony garden is a natural extension of my lounge which has a very contemporary red, black and white colour scheme, I have attempted to continue that out onto the balcony, with modern galvanised steel planters, and plenty of vivid red geraniums, which mark a wonderful contrast against the building’s crisp white washed walls and the black and grey grasses I have planted intermittently amidst blood-red cala lillies and those red-burst strawberries. So without further ado, here are some focused shots of the plants which are currently thriving on my urban balcony garden. I love geraniums – the colours are so vivid and they can flower with such abundance. Sorry to hear yours didn’t work out this year – mine appear to be peculiarly suited to the London micro-climate! The 90 + degree heat my area has been experiencing the past 2 weeks is not helping. It was 91 when I went to bed last night at 10:45. It will cool down to low 80’s starting on Sunday, until then upper 90’s. Wow! Good luck with that heat! Hope you’re making full use of aircon! We’re not used to temperatures like that over in the UK! I love the strawberries, and aliens, and ant! He is so cute and reminds me of our glass ants we bought in Burano.. or was it Murano? Your balcony looks like a little slice of heaven! Nice one. Also what are those skinny norm like ghosts? Love ’em. Gorgeous photos – the entire look is so pretty! I love flowers and trying to photograph how my flowers grow :). Really nice pictures you have. absolutely wonderful flowers. Great effort! I wish I had half as much luck as you seem to have, with the plants on my own balcony and window-boxes! The only flowers with which I seem to have more or less consistent success, are my geraniums and my orchids. Oh – and I have a jasmine whose flowers bloom again and again, but whose leaves are in a terrible state. I especially liked the “dancing aliens” on your passion flowers. My sister manages to grow passion flowers on her balcony and my father has them in his garden, but I must admit, I never thought of them that way before. I must learn to look more closely and to think “out of the box”. Passion fruit flower lovely ! Beautiful images. You have shared your green fingered brilliance with us and you are so right about blogging – it really makes us appreciate the world. What’s your secret with keeping your olive tree alive?! Ours put out lots of shoots in December and then threw a tantrum and dropped all of its leaves from February… Now all we’ve got is a stump (though a little scratching at the wood shows it’s green and still alive). I think you’re slightly ahead of us with the London micro climate – our geraniums and strawberries are still green here in Birmingham. Love your photos. Thanks for sharing. I agree, having plants close up really does transform city living. Enjoyed reading your blog. will return soon. Beautiful photos. I like make photos to flowers. I have a little garden in Italy. “To import some plants into your life” Fine advise! A touch of green is a plus in any place or space. Congratulationss for being Freshly Pressed, I’m glad it took me here. The urban balcony gives a royal feeling…SUPERB !!!! 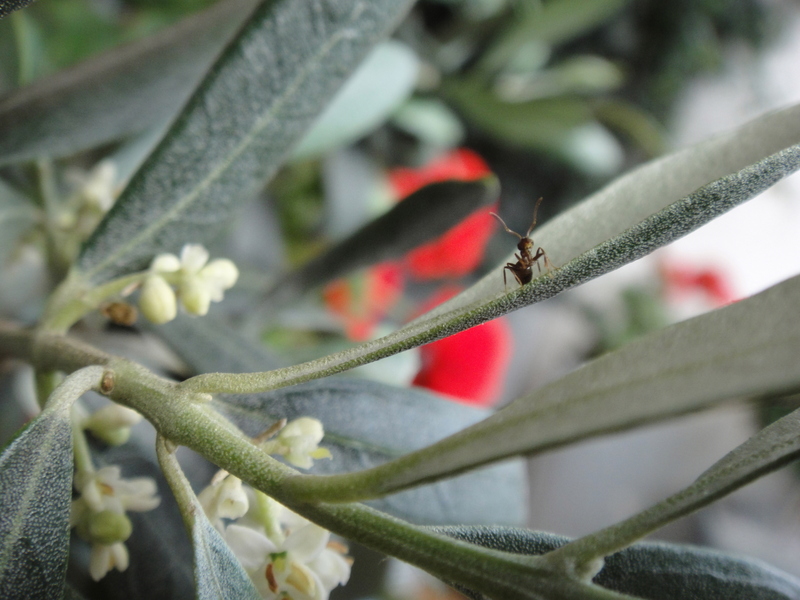 Awesome, my favorite is the ant on olive, ants can make good gardeners as well, although too many can be overkill. What a wonderful reflection! I’m a big city girl who loves the hustle and bustle on weekdays, but by the weekend, I crave the outdoors and nature and must escape to the woods! Beautiful photos! Exactly the same here! It’s not always easy to achieve the urban/ rural balance but I try my best! Thanks for your comment!! I agree with you re the ‘alien’ look of the passion flower — I’ve always thought it looks like some sort of multipurpose interstellar docking station. Enjoy your balcony — nice pics of a nice space! Multipurpose interstellar docking station – love it! You should become a designer for apple! Thanks for stopping by! Thanks for the tip! I’ve never actually seen a caterpillar on my balcony before but I’ve spotted quite a few holes here and there so they must be lurking somewhere! London is undoubtedly too devoid of butterflies. I must change that! Yay for urban gardens 🙂 I live in downtown Chicago in the US, and I don’t have a balcony, so I have to plant inside. So far, I’ve accidentally killed my two cactuses, but for some reason my orchid is still going strong. It’s a learning curve to take care of plants…I definitely need more practice before having a whole balcony garden! Cheers! Thanks! Your message about the cacti made me laugh out when I was just reading it on the tube. I think half of London now thinks I’m crazy! Carry on the urban gardening drive! 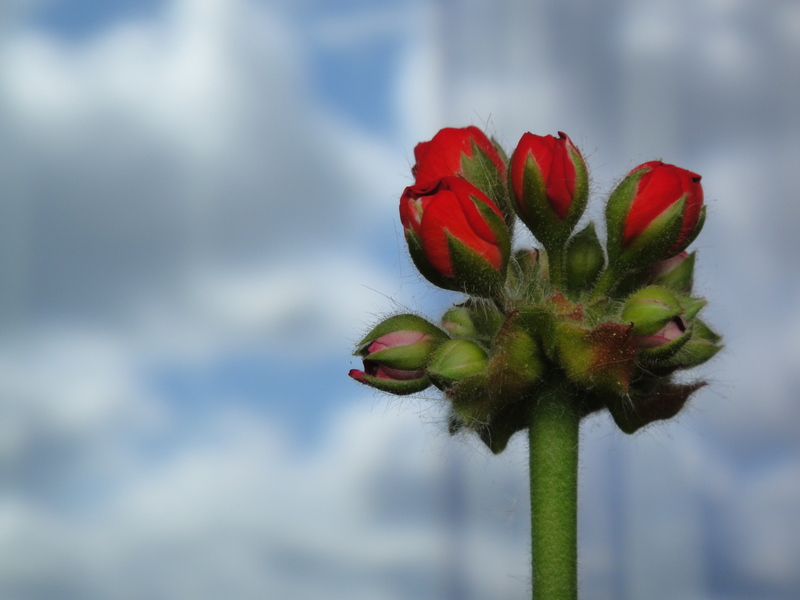 I love geraniums–the brighter, the better. We have a small concrete patio as well and I’ve done the same as you–filled it with bright bits of green and growing things. 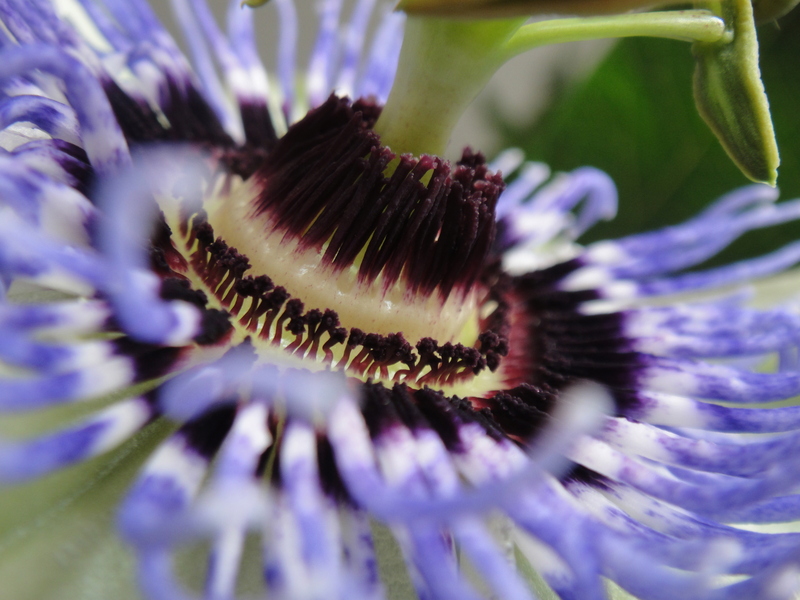 I love the shots of the passion flower. Gorgeous! And congrats on FP! Thanks! Geraniums are amazing. Incredible colour and pretty hardy too. Thanks for stopping by! Strawberry is one of my favorite fruit…good to see it here!! beautiful. I looked at the ant for the longest time and thought it looked like he had an afro. Lol he certainly is full of character! Gosh so it was! I can quite understand the inspiration. Whenever I see my flowers I want to share them with the world! Thanks so much for your comment. What’s a good plant that can survive the fluctuating British Weather? Hey! Geraniums are pretty good but don’t leave them out in the frost. I’m pretty lucky because my balcony is very sheltered so gets protected from the cold to a certain degree. Also grasses are contemporary and quite hardy. Many thanks for stopping by! Sorry to hear about your lemon tree… My mum has one too but she keeps it in a conservatory. I saw old Geraniums in Nagaland, North-East India right at the Chinese Border at 2000m above sea level. The farmers there decorate their yards with them and the Geraniums survive each winter snow and frost down to -5 Celsius. Here in Munich, however, with our down to -20 degrees C each winter, we got to put them in a cool spot inside. Obvious to see: your plants love the spot and care you’re giving them! stunning photos! love your garden! Balconies can make wonderful gardens! Mine is full of vegetables, but I love passion flowers, too – I have six now, in various colours, climbing all over the place. Lovely pictures! Well done for creating this gorgeous green space! Lovely, lovely photographs! There is a documentary in production right now called, Growing Cities… seems like it could be your bag. It will be ready for release by end of year. As an ‘urban’ dweller just outside of Toronto, I have come to cherish the small space that I can cultivate during our short, but plentiful growing season. Thanks for posting this and inspiring me! So glad to be an inspiration! Thank you! Hey! Many thanks! They actually aren’t Norms but certainly look like it hence why I bought them! So glad you like the post. Many thanks again. I recently started a blog and I completely agree with you. Writing about myself in a blog has greatly increased my focus and reflection in my daily life. What a blessing! I love your garden! Have you tried growing any produce? If so, did it work well on your balcony? Hey! Thanks for the comment! I’ve only tried the strawberries and even those I’m reticent to eat in case they’re imbued with the pollution from the nearby road. However they do make amazing honey from bees in the centre of Paris so maybe pollution makes no difference? Perhaps someone else knows? Great photos and I think it is really important to add a dash of colour to the city even if it is only in a small space. And all your plants sound like they bring that colour! I’ve tried to have a flower garden but it gets too darn hot in summer in Texas. I’m more concerned with the trees getting water. There’s always fall planting 🙂 Do geraniums come back again or are they strictly annuals? Stunning photos! It’s no wonder your balcony is your pride and joy, absolutely gorgeous! What a soothing ambiance you have created on your urban balcony garden! Living in a big city my whole life, I was definitely out of touch and sensory deprived- it is so easy to be caught up with all the distractions and not cherish the simple beauties like your red geraniums. Really enjoyed this post! Thank you. I’m so glad, thank you so much – comments like yours make it worth the work! I love planting but the problem is that in winter most of my plants die especially the flowers.I wish I can save them for the whole seasons but that is impossible! It is difficult. Some of the Mediterranean plants need covering with a “fleece” in the winter months which is unsightly but worth it for the thriving life year after year. Thanks so much for stopping by! I particularly enjoyed your description of why writing a blog is so wonderful- it’s all about perspective. Thank you! Congrats on being Freshly Pressed today- good luck with the craziness. Great photos, especially of the dancing aliens. Sometimes we miss the little details. Gardening is great on many levels, some of which you have touched upon. Congrats on FP for the 2nd time! Beautiful pictures. I especially like the ant, and the dancing aliens caption. Thanks for sharing. Your photos are really sharp and the colors pop. Thanks for sharing. Hello fellow urban balcony gardener! I’m thrilled to discover your post. What a luscious bounty you have. Small spaces hold BIG inspiration. Thank you for welcoming me aboard the balcony! Wow you have beautiful Photos! I love the flower that looks like a dancing aliens.. I wish i have a garden like this si lively. Beautiful. I don’t have a balcony at the moment, but I do enjoy seeing the plant that I do have grow. Also love to buy flowers at the farmer’s market. You are quite talented! I love the extreme closeup photography. Just what I would have done! Thanks! I love close up shots too… Enables us to appreciate what there is otherwise too much distraction to see. Thanks for the comment! I’m so impressed. Are all those shots really from a small balcony garden? And are you SURE you’re not in the Mediterranean somewhere? I AM in southern France, but my passion flowers aren’t out, and I don’t think my brugmansia ever will be. But perhaps that’s something to celebrate with a balcony garden. No plant is ever out of sight, out of mind, so it’s never allowed not to prosper. So true! Those plants are part of my interior design really so I do my utmost to keep them healthy. But a lot of it is down to luck. Also the balcony is partially sheltered so a little microclimate is created despite the London seasons. Good luck with your plants! I love it! It’s absolutely wonderful to have that bit of life within the otherwise lifeless walls of a city. Very inspirational! Beautiful to read and beautiful to look at …. Gorgeous photos. I’m a city girl-dweller as well but I don’t have any plants. Occasionally I get flowers from my husband which are nice because of the sentiment, but I actually am extremely creeped out by plants in and immediately around my home. It’s such an odd phobia, but Christina Ricci has it as well so I know I’m not alone. I wouldn’t mind some vegetables/fruit growing nearby though. Strawberries, yum! Congrats on FP! Beautiful post. Loved your photos. Thanks for sharing! I’m glad I found you on Freshly Pressed! Hey thanks so much! It really is true that blogging makes us appreciate our lives so much more but equally it’s great that it connects us in a huge global web. Thanks for becoming part of my web! Thanks for a beautiful post! I’m about to start an herb garden on my patio. I bought some rosemary from our local farmer’s market and I loved it so much that I’m planting some of the sprigs. Thanks! Good luck with your planting! What a beautiful urban green space you have created for yourself. Its a wonderful way to spend time relaxing and enjoying the good life. Wow, great post! I especially like the photos. My garden is fledgling, but slowly getting there! Looking forward to the next post! FYI, the seeds of the passion flower FRUIT are WONDERFUL infused in a fine grade vodka! Who knew? I tried this a few summers ago when I had this plant growing here, and OMG! IF you would like a huge infusion of garden, green, and other natural images, please visit my blog/world. Cheers! God how cool! Will defo get out the vodka when I get home to my balcony! The seed pods are funny looking, yet the seeds are what you want in the vodka! Have fun! The passion flowers are one of my favourite flowers.. they’re so unique. I love all vines, but those are so awesome. Wow! those are beautiful things. Congrats on being FP! I love seeing people bring some greenery and tranquility into their city homes, beautiful photos too! All are beautiful, though the passion flower is my favorite. It is amazing what can be grown in a small, urban environment–I live in a suburb, and nothing on my lawn is as beautiful as those (except the live oak trees). Thank you so much for sharing this with us! Thanks for the glorious salutation to plants! I really enjoyed the walk through your garden. Very nice! I have a vertical garden myself – I’m in the country, but I rent and I don’t want to dig up the yard. I just started the garden this year and things are going great! Plants play imp. role in one’s life.. like small kid, they also need care and affection from us. Very well techniques have been employed by you. This is really charming. Would like to know more about the techniques. What can I say? Just patience and watering and the occasional help of fertiliser! Also my plants are quite sheltered from the wind and get plenty of morning sun but not all day sun. Seems to work for them. Nice post! Congrats on being Freshly Pressed!!! Beautiful pictures and beautifully written! Lovely! Great photos and pretty flowers. Very beautiful photos and very well written post. I love looking into the lives of those in other parts of the world. I am new to blogging and am falling in love with the opportunity to experience life through the eyes of so many. Your photos are lovely and I look forward to learning more about your life in London by following your blog. Cheers! You do very well. I want to start growing herbs in my kitchen. I was watching Home and Garden channel and it seemed pretty simple to do. Thanks for the post. these pictures pop out of the screen, nice shots! I love the strawberry, the passion flower, and the greenery. The colors are dazzling! Gorgeous photos! I especially love the passion flower. Wow – what a popular website! – and I wish there was a tick box as I could have ticked away until my arm fell off – geraniums, ants, black grass, strawberries and so on… – its been the most relaxing year I’ve had gardening! – for a wood turner! Hey! That made me laugh – thanks! Don’t be losing your arm over my blog – your wooden creations are way too good for that! Look forward to seeing more. At least your able to grow things. Unfortunately I have a black thumb, therefore I allow others to do the cultivating. I simply make sure to enjoy their endeavors every chance I get. It sounds like you have a wonderful balcony. Love your post & beautiful photos! A good read and yes, I keep a garden and a fairly large green space! Lucky me! Amazing. Mine is just starting. I finally moved to a new place last month and it has a big balcony 🙂 . Mine is mostly vegetables but I do have some roses, a plum tree, santan, lily of the nile and a violet plant which I don’t know the name yet. Good luck with your balcony! Look forward to reading up about it on wordpress! I love the passion flower, always am amazed at its incredible design! Likewise! It’s nature at its very best! Transforming balcony to beautiful garden is awesome process which keep u close to nature and gives u peace of mind. An enjoyable read! I love your little urban garden, the dancing ‘aliens’ and other friendly garden life. The photographs are quite lovely. I hope I can plant strawberries in my urban garden. Grow Your Own Food Even in Urban Areas? Thanks! Looking forward to seeing it – you have some amazing photos on your blog by the way! What a lovely post! Urban gardens are great, and the photos you took are amazing. Love the color in those flowers! Congrats on being freshly-pressed and thank you for sharing! I love the bright red of the geraniums against the white – just gorgeous! SO GORGEOUS…& i love your dancing aliens/passion flower! wow! its inspiring to see how you have utilized your gardening space. It looks amazing.. I am plannig for balcony garden the ideas of u inspired me but need some more to make it more attractive.